We’re told that less than one percent of American fathers are full-time dads. Every good dad is a full-time dad. But it does make a difference what shift you take. Hel-lo Mommies, hel-lo Mommies, hel-lo Mommies, we’re glad you’re here today. Hel-lo Grandmas, hel-lo Grandmas, hel-lo Grandmas, we’re glad you’re here today. Hel-lo Nannies, hel-lo Nannies, hel-lo Nannies, we’re glad you’re here today. And hel-lo Daddy, hel-lo Daddy, hel-lo Daddy, we’re glad you’re here today. That’s Ms. Jennifer’s music class greeting song. That last line is her and the preschoolers singing to me. After grandmas. And nannies. 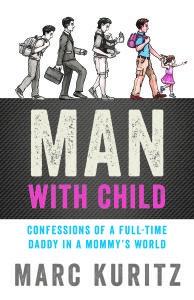 Man With Child is the travelogue of a full-time daddy in a mommy’s world. For daddies and daddies-to-be, here are some observations, warnings, and minor revelations. For mommies who stare at daddies as if to say “What were you thinking?” here is one dad’s answer. Both mommies and daddies will find insights about each other’s perspectives—with plenty of laughs along the way!